Gemma Merna is best known for playing Carmel Valentine on Channel 4's popular soap, Hollyoaks. Appearing on our screens since 2006, Gemma has seen her character go through many trials and tribulations, including her current storyline where her faith is tested with the gorgeous Father Francis (played by Richard Windsor). Her role as Carmel won her the hearts of the show's viewers and an award for Best Comedy Performance at the The British Soap Awards in 2007. 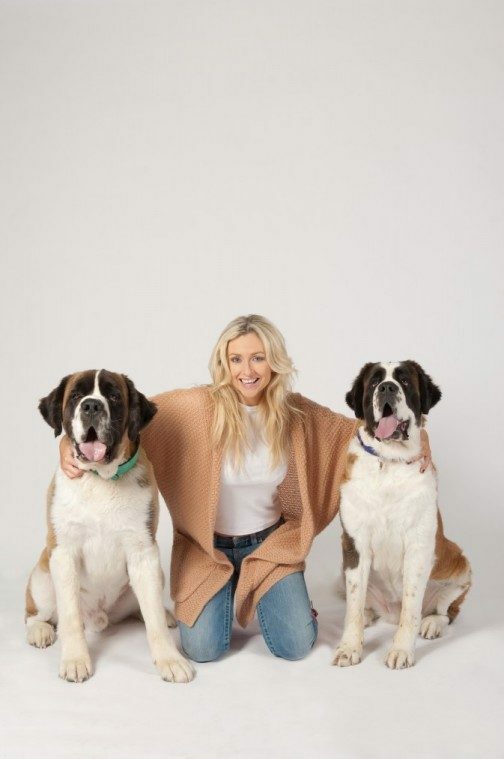 Kim O'Meara recently caught up with Gemma to find out all about her hopes for Carmel's future, her love of dogs and curing herself of her big dog phobia. We got Cole when he was around four months old, he's a St. Bernard and he's just had his birthday. We also have Phoebe, who's a Westie who was three years old in March and to begin with before we had Paige, it was just Cole and Phoebe. They used to play constantly, they'd never let each other settle down. A year later we went back to the place where we got Cole from and they had this eight week old St Bernard girl who was there on her own. She was very chilled and I begged Ian, my partner, to go back and see here. So we went back on the Saturday and saw her again, she was this gorgeous, tiny, laid back little thing who just lay in my arms and that was it. Together the pack is much more chilled out now. Paige is such a calm girl she's had a real calming influence on Cole and Phoebe. I think having all three means there's always someone for them to play with aswell. We've always had dogs such as Boxers, Shih Tzu's, Staffordshire Bull Terriers, growing up and it was great. From the point where I hit my teens for some reason though I just remember always being scared of big dogs. Ian's parents have a Labrador and I just remember being scared to death of him. I knew I wanted to get over the fear, I do think something like going to a local rescue and just getting used to being around dogs could be good for someone who has a similar fear. For me, I knew if I had a big dog I'd get over the fear and so that's what I did. I think because Cole grew up with me and I saw him from such a young dog, I was able to somehow not see him grow to the size he has, which sounds odd I know, but I think sometimes you just have a picture in your head that they're forever a certain size. There's only every been the odd moment where he's been a 'big dog' and tried to use his strength when we've been walking or something like that and I've just been firm with him and he's been absolutely fine. You've been playing Carmel Valentine on our screens since 2006 in Hollyoaks, what do you love most about the character you play? I love playing Carmel because she's so fun.She's always happy and we have a lot of fun with her. It's great being able to play her because she makes the time go so fast aswell. Your job must mean you work long hours at a time, to then having a stretch of time off, do you have a routine for Paige, Cole and Phoebe? We do, it's a funny job where you can be away for hours and then back home for a bit of time, luckily Ian's business is flexible and he works close to home but we have a large garden, massive kennels and we give them everything they need so they have chilled out day and then come in with us when we get home. Hollyoaks seems to be getting more and more recognition through the national awards every year, do you think that's down to the storylines, the close knit cast or a combination? It does, it's great to see. I think it's a combination of both to be honest, we've had great storylines and lots coming up, which are always exciting to work on but because everyone on the show does get on so well I think it helps to really show the established relationships on screen. If you were to choose a motto that Paige, Cole and Phoebe might live their life by, what do you think it would be? (Laughs) I think theirs might be 'eat, sleep and walk'. They like to sleep, chill out, play and walk – they're not used to work, this photoshoot tired them out! If you were to swap roles with either Paige, Cole and Phoebe for a day, how do you think they'd cope being you and what would you most love about being them? I think I'd have to swap with Paige, she's so chilled, nothing fazes her. She's in the middle of a bit of a pack leader fight with Phoebe at the moment because Paige is getting older. I'd love being her, I'm not sure how she'd cope being me though! Alan Carr – He'd have to be a Pug wouldn't he? (Gemma asks the Hollyoaks team behind her and gets a big thumbs up). Lady Gaga – She's definitely a Chihuahua, no question! Big dogs or little dogs – I love both. Phoebe's a little girl and it's so easy to take her anywhere and put her in the car. You can still do the same with big dogs and you get the classic big dog cuddles. I couldn't choose between them, I love them both. Pedigree dogs or x breeds – It doesn't matter to me really, I think it's about the connection you have with that dog more than the breed, that's what's more important. Days off or days at work – Days at work, I love what I do and we have a lot of fun onset. Describe the last time you laughed outloud because of something you saw Paige, Cole and Phoebe, or another dog do. It was a few days ago, we were in one of the bedrooms at home looking out onto the garden. Paige and Cole were in the garden and looking up at us. I noticed Paige had her lip stuck and looked like she was smiling. I started talking to Cole to see if he'd so the same thing and he did! So they were both looking up at us, looking like they were smiling and because I was speaking to Cole he was tilting his head at the same time. It was so funny, one of those moments you wish you had a video camera for! Hmm, firstly I'd invite Marilyn Monroe because she has a story to be told. Then it has to be Doris Day, I love all of her films and thirdly I think it has to be the one and only Elvis Presley. A classic dinner party. TV show – Has to be Hollyoaks, doesn't it?! Film – It's not a current one, it's The Proposal with Sandra Bullock. It doesn't matter how many times I've watched it, I still love it. Everything! They are so loyal and loving, they ask for nothing but to be fed and watered and they give unconditionally. They're always there when you get in and they just bring so much happiness. Finish the following sentence, my dogs are... amazing! And finally, this is always a tough question and often requires a fair degree of thinking time but….If Paige, Cole and Phoebe had the ability to speak and answer one question and one question only, what would you ask them and what do you think that they would say? I'd ask them all the same question – 'are you happy at home and is there anything else you would like?' and I think they'd all say yes because they're spoilt and well loved!